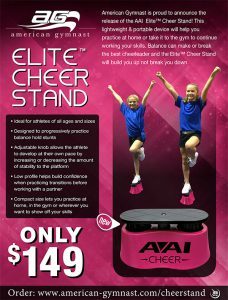 Announcing the brand new Elite™ Cheer Stand! Proper balance training separates Elite cheerleaders from the rest of the squad. Lightweight and durable, the Elite™ Cheer Stand is the perfect training aid for cheerleaders to use at home, in the gym, or anywhere! Order your’s today!